Added by Indo American News on May 30, 2013. G. Anantha Aiyer, a multi-talented Engineer who won numerous awards in India and America for writing, directing Tamil dramas. A native Houstonian, he was the founder of a Tamil drama company in America, and was interviewed by Padmaja Sarathy, PhD. 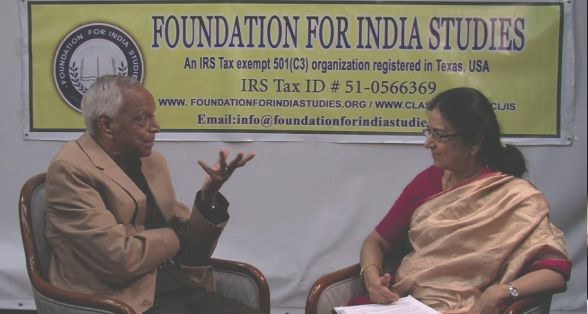 HOUSTON: Octogenarian, Anantha Aiyer, a native Houstonian for more than 35 years was interviewed at HCC studios on May 17 for the Indo-American Oral History project of the Foundation for India Studies (FIS). Anantha at 81 does not look his age. Still walking upright, active and full of zest for life, he engages himself to the promotion and propagation of Tamil language and culture. Tamil is the oldest and richest classical language, only after Sanskrit, that has existed in India for more than 2000 years and FIS is proud to have been instrumental in recommending more than 250 Tamil language books to Houston Public Library which are available today for the public to borrow. After leaving for London, UK in 1965, Anantha pursued his interest in Tamil theatre, by writing, producing, and staging Tamil plays. Traveling extensively in Europe, he staged many Tamil plays in several European countries. In 1967, he was a founding member of London Tamil Sangam and actively participated in cultural and religious projects for several years. The group presented radio plays for the BBC which also had a good number of listeners in Singapore and Malaysia, until he left for New York in 1973. His love for Tamil theatre and his culture, led him to form his stage company, “Vadivel Theatres”, in 1975, with which he staged numerous plays, including the extremely popular “Thanikudithanam”. While in New York, he joined the executive committee of Bharathi Society of America, and later became President of the organization. During his time in New York, he staged many Tamil plays, and traveled all over the Northeastern US performing in many cities. In addition to his affiliation with the Arts, he was also very cultural and civic minded, and participated in many fundraisers for the Ganesh Temple, in Queens, NY. In 1977, he moved to Houston, with his wife, Padma, and his two children, as job opportunities were plenty in the oil and gas industry. Once in Houston, he was inducted into the Sri Meenakshi Temple Project, and became one of its founding members. He also founded Tamil Stage Creations the same year. Over the last 35 years, Anantha has written over 20 original plays, and has staged Tamil plays for 35 consecutive years to commemorate either the Tamil New Year, or Deepavali, each year. For nearly 40 years he has been writing, directing and presenting Tamil plays in America. The Nataka Academy in Chennai, in association with the Sri Parthasarathy Swami Sabha and the Brahma Gana Sabha, felicitated Anantha in 2005. Many well-known celebrities, prominent musicians and the secretary of the Federation of City Sabhas paid rich tribute to his extraordinary talent. A few of his plays have been picked by producers to be presented on the silver screen. He was the first to venture into a mega monumental production, “Washingtonil Thirumanam” for television, and many artistes from Chennai visited the U.S. to participate in it. The serial telecast by Doordarshan in 1996 won the Mylapore Academy award for best TV serial that year. Anantha has been the recipient of numerous prestigious awards and titles, including “Nataka Siripi,” “Iyakkunar Imayam,” and “Nataka Thandhai” . He has received awards from both Indian and US based Arts Alliance organizations. In recognition of his great community service and to further honor Anantha and Tamil Stage Creations, the City of Houston, and Senate of the State of Texas had made the proclamation as “Tamil Stage Creations Day” on October 17, 1998. He has celebrated his 35th anniversary of his theatre company, with 35 consecutive stage productions since 1977. Most recently Ananatha was awarded the” Kala Bramha Award” by Austin based Kalalaya Productions. This award is to recognize the significant contributions of key individuals who have presented live theatrical performances in North America. The institution honors the stalwarts who have contributed to the Performing Arts. With his philanthropic demeanor he has contributed generously to stage plays to benefit fund raising efforts for Sri Meenakshi temple in Pearland. Recently Anantha celebrated his 80th birthday with scores of friends and family by his daughter Luckmi Anantha Pawa, and his son, Jay Aiyer, their spouses, grandchildren and numerous friends. When asked, what his message would be to the future generations of Indians, Anantha’s clear message is: “Preserve our Heritage, Pursue Dreams, and Perform with Passion”. Article contributors: Thara Narasimhan, Luckmi Anantha Pawa and Padmaja Sarathy, PhD.